Synopsis- Mira Levenson is bursting with excitement as she flies to India to stay with her aunt and cousin for the first time. As soon as she lands Mira is hurled into the sweltering heat and a place full of new sights, sounds, and deeply buried family secrets . . . From the moment Mira meets Janu she feels an instant connection. He becomes her guide, showing her both the beauty and the chaos of Kolkata. Nothing is as she imagined it – and suddenly home feels a long way away. Review- I came across Jasmine Skies at Delhi airport during one of my stopovers (I was in that airport 4 times!) and was firstly attracted to the cover and then I saw that it was written by an English-Indian woman and was further intrigued. The story is actually the sequel to the author’s first novel, Artichoke Hearts starring the same protagonist, Mira Levenson but at an earlier age. However, this book can easily be read as a standalone novel. 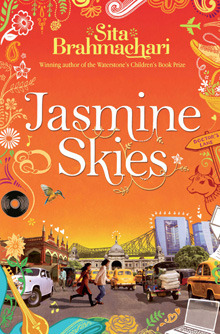 Jasmine Skies is about an English-Indian girl meeting her extended family in Kolkota for the first time. I didn’t realise the protagonist was only fourteen years old and was a little sceptical about whether I would enjoy it, but I did. Mira has a fresh, mature voice and a keen interest in her family history, wants to maintain a good relationship with her family and has a boyfriend, Jide of three years -a very long relationship for a 14 year old, but it seems their relationship is fairly innocent and they are best friends. Mira has been skyping her cousin Priya in Kolkota for some time since the death of her grandfather and has finally been allowed to go and visit for a couple of weeks. Not only is Mira looking forward to spending time with her cousin and her aunt Anjali but she also hopes to uncover the mystery behind the estrangement of her mother and Anjali when she visited India at the same age as Mira. But the moment Mira “borrows” her mother’s childhood letters from her cousin she feels she has set off a spiral of events which leads to her lost luggage, her search for the house on Doctor’s Lane and the significance of the key she keeps visioning. Mira and Priya get along like a house on fire, Priya’s bubbly easy going style compliments Mira’s sensible but creative nature. Anjali becomes another mother figure and Janu, the intriguing boy who helps Anjali run the local children’s shelter, Mira is drawn to him in a way that makes her question her relationship with Jide. Mira learns many lessons during her holiday, including the importance of family, privacy and shared experiences. She discovers the heavy feeling of guilt, regret and the pleasure of new experiences, new perspectives and new friendships. Although I felt the big “secret” behind Anjali and Mira’s mother’s falling out was a bit of an anti-climax, in hindsight it did fit well with the overall message of the story. Brahmachari weaves very serious issues throughout Jasmine Skies in a thought-provoking way. Mira arrives in Kolkota and is confronted with poverty, prejudice, cultural differences and various religious beliefs and begins to reflect and appreciate on her own more privileged life back in England. The author is very skilled at bringing the setting to life through all the senses and i felt as though i really were in Kolkota seeing it through Mira’s eyes. In fact, i’d like to add this destination to my itinerary if i am ever to return to India! Jasmine Skies is actually a beautiful story for pre-teens to read and I would recommend it to parents who want their young daughter to read a book that doesn’t revolve around beautiful paranormal heroes and a fantasy world. Oh, and adults will love it too- i surely did!